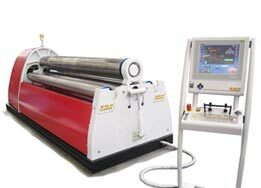 Are the best quality modern bending machines, designed to be innovative and performing at the highest level. The DAVI plate roll take advantage of the modern technologies as the lubrication free and the planetary swing guides PSG that gives substantial benefits to the user. 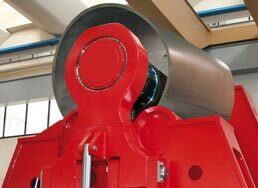 In the past year plate roll were built with mechanical gear for rolls rotation and then became hydraulic but with side rolls moving along linear guides. These guides, still used by some manufacturers, need to be cleaned and lubricated any single day, to avoid premature wear of the guides that could decrease the quality of the finished shells. Newly designed plate roll don’t have problems for lubrication or wear, assuring the same quality without the need of daily maintenance, saving time and costs. The modern automation is another DAVI PLUS that allows getting a high productivity reducing manpower and maintenance. Remote online service helps the customers in case of needs thanks to DAVI Customer care. DAVI plate roll offer to customers the possibility to work in manual or automatic mode, allowing the user to bend batches of plates in the shortest possible time and assuring the highest productivity. It’s the case of Wind Towers construction which has to respond to strict productive schedules to build the entire tower to deliver to the customer. Modern plate roll must also respond to quality exigencies the plate roll must respond to precise requirement, in order to obtain the desired roundness without the need to spend long time in manual adjustments that decrease the quality of the parts.